Can you sidestep Alzheimer’s disease? Alzheimer’s disease is characterized by progressive damage to nerve cells and their connections. The result is devastating and includes memory loss, impaired thinking, difficulties with verbal communication, and even personality changes. A person with Alzheimer’s disease may live anywhere from two to 20 years after diagnosis. Those years are spent in an increasingly dependent state that exacts a staggering emotional, physical, and economic toll on families. A number of factors influence the likelihood that you will develop Alzheimer’s disease. Some of these you can’t control, such as age, gender, and family history. But there are things you can do to help lower your risk. As it turns out, the mainstays of a healthy lifestyle — exercise, watching your weight, and eating right — appear to lower Alzheimer’s risk. Have you noticed memory problems piling up in ways that affect daily life in yourself or someone you love? Do you find yourself struggling to follow a conversation or find the right word, becoming confused in new places, or botching tasks that once came easily? About 5.4 million Americans have Alzheimer’s disease, and estimates suggest it will affect 7.7 million by 2030. Already, it is the sixth leading cause of death in the United States. This Special Health Report includes in-depth information on diagnosing Alzheimer’s and treating its symptoms. While there are no surefire ways to prevent Alzheimer’s, by following the five steps below you may lower your risk for this disease — and enhance your overall health as well. Maintain a healthy weight. Cut back on calories and increase physical activity if you need to shed some pounds. Check your waistline. To accurately measure your waistline, use a tape measure around the narrowest portion of your waist (usually at the height of the navel and lowest rib). A National Institutes of Health panel recommends waist measurements of no more than 35 inches for women and 40 inches for men. Eat mindfully. Emphasize colorful, vitamin-packed vegetables and fruits; whole grains; protein sources such as fish, lean poultry, tofu, and beans and other legumes; plus healthy fats. Cut down on unnecessary calories from sweets, sodas, refined grains like white bread or white rice, unhealthy fats, fried and fast foods, and mindless snacking. Keep a close eye on portion sizes, too. Exercise regularly. This simple step does great things for your body. Regular physical activity helps control weight, blood pressure, blood sugar, and cholesterol. Moderate to vigorous aerobic exercise (walking, swimming, biking, rowing) can also help chip away total body fat and abdominal fat over time. Aim for 2 1/2 to 5 hours weekly of brisk walking (at 4 mph). Or try a vigorous exercise like jogging (at 6 mph) for half that time. Keep an eye on important health numbers. In addition to watching your weight and waistline, ask your doctor whether your cholesterol, triglycerides, blood pressure, and blood sugar are within healthy ranges. Exercise, weight loss if needed, and medications (if necessary) can help keep these numbers on target. 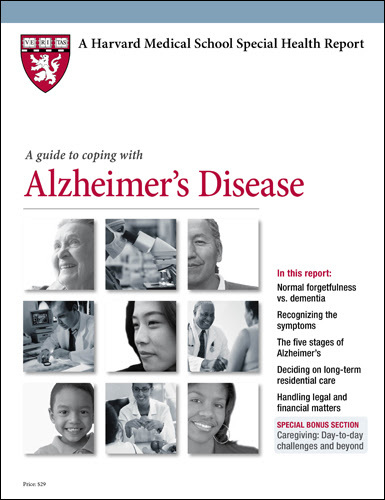 For more on ways to help prevent Alzheimer’s as well as information on diagnosing and treating it, buy A Guide to Coping with Alzheimer’s Disease, a Special Health Report from Harvard Medical School. Ordained to the priesthood in December, 2010. This entry was posted in aging. Bookmark the permalink. New Medical Worry: Deadly Fungal Infection That Resists Treatment. Monday thru Friday - 9 a.m. to 5 p.m.
An on-call chaplain is available 24 hours a day and may be contacted by calling (650) 723-8222, and then entering the page number: 15683.